Life is all about managing expectations. And, to be honest, I'm often times not expecting as much when I bite into most milk chocolates. But, today, I transported myself back to Hawaii. 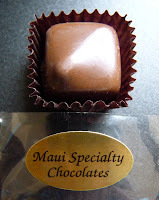 And, in my book, today's coffee-flavored chocolates from Maui Specialty Chocolates (Kahului, Hawaii) were toward the top of the milk chocolate scale. I bought this small 4-pack of chocolates while on a recent trip to Maui. I carefully slit open the plastic pouch, and a delicious Kona Coffee smell wafted up to my nose. I enjoyed the first piece (of three that I ate today), all by itself. And then, because this was Day #6 of Tout Sweetener Theme Week, and Day #1 of Chocolate and Sea Salt Theme Week, I experimented with some "dry" sugar and salt dunks. 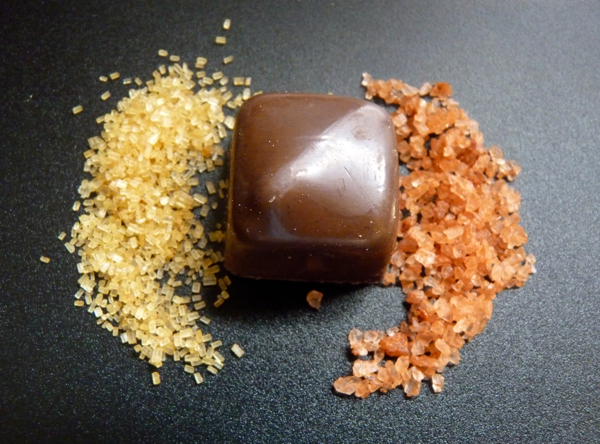 I dipped the second chocolate into some raw Hawaiian sugar (obtained during a tour of the Alexander and Baldwin Sugar Museum in Kahului (Maui), HI). 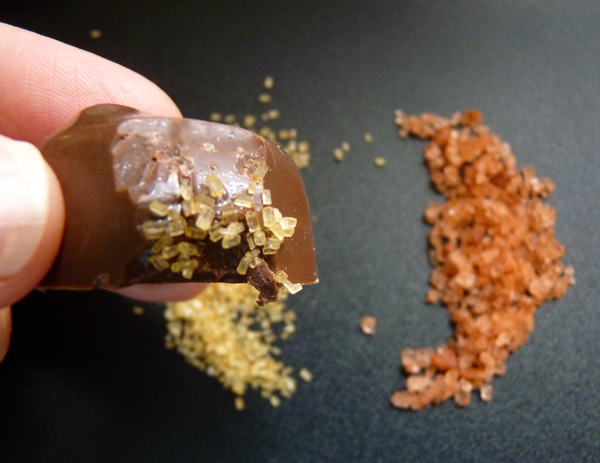 The grains of this less refined, golden sugar, added a little bit of a crunchy, rich sweet texture to the already rich, smooth coffee and milk chocolate. 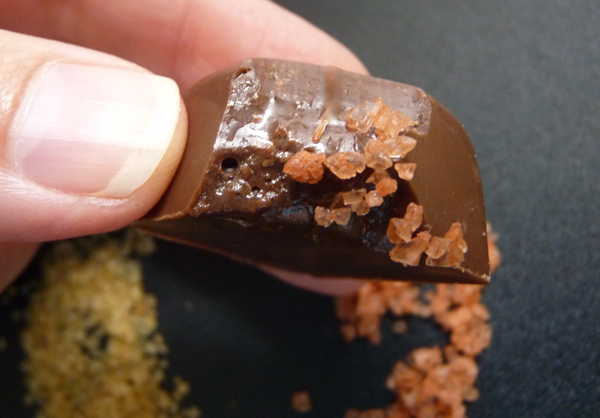 Last, but not least, I dipped the third Kona Coffee chocolate first into the raw sugar (and took a bite), and then dipped it into a few grains of Hawaiian Traditional Red Alaea (Molokai Seas) Sea Salt. My first bite with the salt (shown) contained way too much salt; but after adjusting, and backing off to just a few grains, it was perfect.